AquaFluid is a two column, fluid width, sidebar widget compatible wordpress theme. Updated for Tags feature in WP 2.3. Specify the pages to be excluded from the top navigation. Those will be hidden from the top navigation, but still available from sidebar. Specify how those pages should be listed. alphabetically ? by order number ? or the date of creation ? Specify the category for “Asides / Quick Bits”. 2. Improved Look for the contact page template. 3. Page Template for ‘Favorites / Links’ Page. It has many more features in the theme, that you can explore in the readme.html file included in the zip file. Download AquaFluid 3.0 for WordPress 2.7 or greater. If you are using a older version of WordPress, please use the following version. I just started using this theme and I really like it. It is clean, neat, and very easy to use. Congrats on a job Well Done! I’m liking this one – it’s one of the three candidates for adoption for my new blog. the only comment I would make is that when the content is long the sidebar background doesn’t extend down to the bottom of the main content. you were right about that. but I made it this way, so People can freely move the sidebar to be floated on right if they want. I have installed AquaFluid on my collective blog. Everybody likes it. It’s cute and functional. One of the authors asked me whether it would be possible to fit a logo (or a picture) somewhere in the header. I have found an interesting blog that uses AquaFluid. It has a logo in the header, at the left of the blue band. I wonder how this is done, technically. I put the URL of this blog under my name. 3. upload it to the ‘midasoracle.org/wp-content/themes/aquafluid/img/’ folder. 5. look for ‘repeat-x’ and replace it with ‘no-repeat’ and save the file. You would be seeing the logo then. For your information, one of my Blog Author is using Opera/9.00 (Macintosh; PPC Mac OS X; U; en) . He is experiencing a bug. The login area is mixed with the name of the blog. If you e-mail me, I can provide a screenshot. PS: Thanks again for this great theme. Everybody likes it. I saw your screenshot in the email. I do not know what causes it. It is something to do with the way Safari deals with Floats. I will post about it if I find a cure. Please note that I released an updated version today. see above for the features. I am experimenting (i.e., complete newbie) with WordPress and am using AquaFluid (nice, clean theme). I would like to try having only the first 4-5 lines of posts displayed but I do not see a setting in either WP or AF to do so. Is there a way to do so? Can anyone give me a pointer in the right direction? For every post, go into edit mode. after the first four lines, insert the following text. and hit save and view the site again and see if thats what you want. Sadish, that works great! Thanks! Slowly I learn a few useful things. Now, is there a way to set a switch to have WordPress or AquaFluid do that automagically? If not, this will work. Thanks again, AquaFluid is nice looking adn I have had notproblems with it thus far (unlike some other themes I tried). Good job! Does anyone know what to do to have the categories, on the sidebar, listed alphabetically? use ‘sort-column=name’ as a parameter to wp_list_cats to sort it by name. Started my blog with your theme – great job, thanks. I made some little changes, added some plugins and the main job was to translate all the texts into German (I hope I get everything). As already wrote I am very happy with your theme. Only one question: There are files like pages-download.php, page-archives.php, page-links.php and so on. In which case these files are used? these are “page templates” that come with the theme. “1” is the Archives Page Template. Create a New Page using the write page option within the wordpress admin. choose ‘archives’ as the page template. then when someone views this page, page-archives.php will be loaded. “2” is the Favorite Links Page Template. choose ‘Links’ as the page template. then when someone views this page, page-links.php will be loaded. “3” is the Contact Page Template. choose ‘Contact’ as the page template. then when someone views this page, contact.php will be loaded. This gives an easy option to create a contact page without installing any plugin. People can email you using this page. the email will be sent to the email address entered within wordpress options as the ‘admin email’. Hope you are clear now. I would like to add a link to AquaFluid under the “Meta” grouping. Could you give me pointers? When using a screenresolution greater than 1024×768, I get a strange line going fra top to bottom on the right side of the sidebar. I see the same problem on your “Live preview” page. How can I fix this? go into style.css and look for #sidebar. make the background to just say #f0f0f0; and remove the reference to the image. That would solve your problem. Sadish, I’m trying out your aquafluid theme now…one request when you next make an update. Can you add the About and Subscribe sidebar info on as options when someone is using widgets? Those go away for me when I use all my widgets. Actually the RSS links come up under the Meta tab…maybe this is because I switched from the other theme? I like how you have them separately in the subscribe tab better. Also, my verse of the day widget at the top of the sidebar ocassionally does not wrap the text properly (it gets cut-off). It only seems to happen on the home page. Will it hurt anything if I make the sidebar a little wider? Thanks for the great work again! Also, I have the same problem as Michael and tried what you suggested but it didn’t work. Is this the code you were referring to? you are really becoming an annoying commenter, seriously. When I am saying about #sidebar, where are you coming up with sidebox ? the sidebox is the one in MistyLook theme and is not present at all in AquaFluid. I dont know why you are applying what I said to Micheal, to Mistylook theme !!! if you do not understand what you are doing, kindly do not touch those files at all ! Thanks for the information about the additional *.php files in the template. I have used now “archive” – works well. For the “contact” file I would like to suggest to implement a Gaptcha function in a future version, too. Thanks for the solution to the sidebar problem. Worked like a charm! I’m very pleased with the AquaFluid theme. Continue the good work. Never mind Sadish, I figured it out…don’t know why the style.css file shows differently in WordPress than if I open it directly but that was my problem. LOVE it!! Thanks for this beautiful and simple theme. I’ve already modified it a bit with image rotation in the header and some other bits in the sidebar… that only took me a few minutes. A great, slick, clean, elegant look! As you know I am happy with your template. One problem I found. I wanted to install the WordPress plugin DashBar or DashBar [k]. But this plugins do not work with AquaFluid. If I am switching to an other template the dashbar is displayed. So it seems AquaFluid and Dashbar are not compatible – I had a short and tried to compare AquaFluid with an other template to find a solution. But I don’t arrive. Just add the following line to the footer of the theme. footer.php, just before the closing DIV. Yes – great! You found it – thanks a lot. I found an other little problem. If you give a link to a non existing posting – there is a message that the posting isn’t found – and this is ok.
it must be from somewhere else in your code. Well – on http://try.wpthemepark.com the permalink option is set to “date and name”. If I switch on my blog to this option I don’t get the described error message from the database. But normally I have the permalink option “Standard” – and with this option I get the database error message when the URL pointes to a non existing message. I found the problem – was a mistake in single.php – addition lines for a plugin were at the wrong place. It’s ok now. Sadish, I am pretty much an amateur, just starting out with my blog. Have installed all the files in my server. Initially everything was fine, but suddenly the sidebar moved to the bottom, below my first posting. I just cannot understand what is the problem. Could you help please ? hi sadish, very nice theme – i will use it… question: i know the name is aqua fluid…but it is possible to make a fixed width of 950 px ? i think i like that better… could you help me? where do i need to change the code? I just installed Word Press today and after many hours of searching, found your Aquafluid theme – it is fantastic and just what I was looking for. One thing that puzzles me, on my main page which displays correctly using the default theme, when I switch to yours, the post text is no longer formatted the same, i.e. the the whole text of the post wraps leaving a jumbled mess. I looked at the source in edit mode and paragraph tags etc are there but they are not displayed that way on the page. Hope you can help as I really love this theme. I think you have selected the category as an “asides” in the theme options page. go ahead and unselect it and you will be all right ! Thank, thank you, thank you!! An excellent them, thank you very much for taking the time to do it. Simply love AquaFluid theme and all other you have givem. Am using it for an educational website under construction. what happens is there is a vast empty space between any 2 posts. Plz can u tell me how do i clear this with the help of CSS. Thanks once again. Not bad.. but this theme looks familiar elsewhere.. Need help again. I am using version 1.5 but cant even after installing widgets cannot figure out anything like “Sidebar Widgets” in the Presentation Menu. How do i get it? this template is very beautiful. can i use it with wordpress 2.1? Interesting template, i’ll add it to my collection of wordpress templates. Will this template have updates in the future for compatibility with wordpress future versions? I am using your template – I made some small changes and translated the text into German. 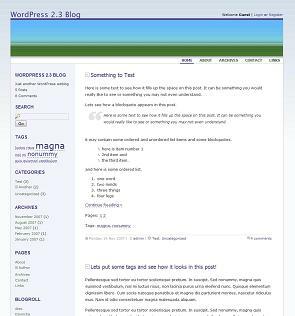 One problem: A author of a plugin told me that the template is still using some very old functions of WordPress version 1.5 – and the plugin didn’t work with the upgraded WordPress 2.1. The problem occured with the “page.php” file. I like the theme. but one problem occurs. I want posts to be appear as summary in home page and categories. Despite making settings as summary in the read option tab the site does show the full text. Any body can help me out. First of all Thanks for your beautiful theme. Do I need to change anything in the header.php ?? Please take any kind of support related questions to http://wprocks.com/forums/ and create new discussion in that site. It is much more easy to manage than putting comments on this site.